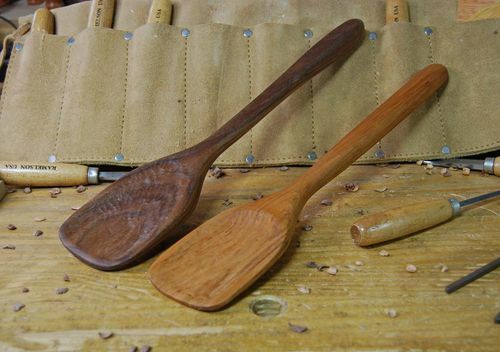 Hi everyone, time for another quickie project…the last few spoons I’ve completed this summer. I’ve seen this format before, so hope I’m not breaking the rules too badly by posting the large photos below with the text…lots easier for ME to read. Hopefully, you guys, too! LOL. 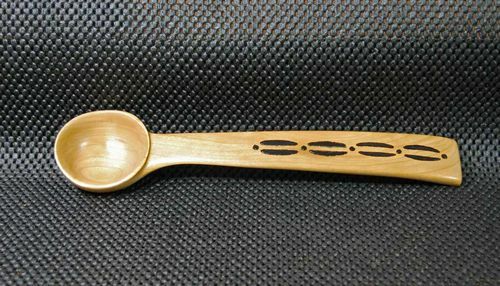 The two spoons above were made completely using hand tools. I even cut the blanks out with a coping saw, but not sure I’ll try that again! Both were shaped with rasps, gouges, and the cherry is actually finished with a cabinet scraper. The open grain of the walnut demanded sanding for a better feel. Finish is oil/wax. About 12” long. The next spoon , from Cherry, had the handle turned on the lathe; then I carved the bowl with the usual power tools. A fairly simple design just to test the principle…expect to see a few of these! Again, the finish is oil/wax. 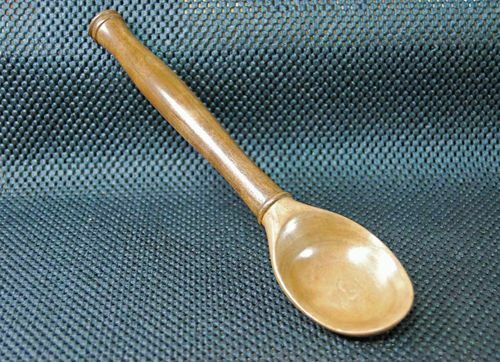 The above scoop-shaped spoon is made from Brazilian Rosewood, and about 9” long. Luckily, this stuff has come OFF the Endangered Species List in the past few years! This little guy was hand-sanded to 400 grit, then buffed to a high shine. The wax finish was also applied with buffs since I love the extremely hard coat left on the wood. 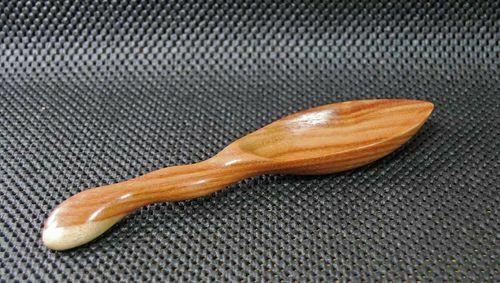 I’ll probably finish more spoons with the buffs, as long as the wood can handle the reddish tint of the 500 grit Tripoli. Some woods look horrible IMO after exposed to that Tripoli, so I’ll just hand sand them past that grit and apply the buff wax. 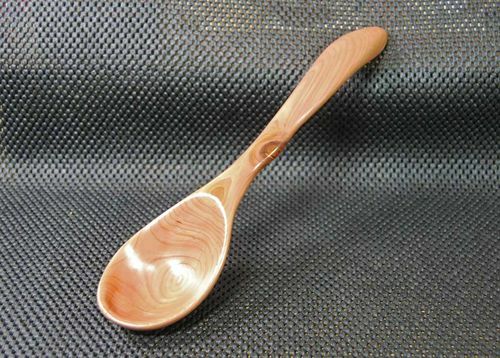 The next spoon was also carved from Cherry…I have a ton of Cherry. A simple raised bowl and a keel underneath for added strength. For the tribal motif, I burned in the outlines and filled in with 2 coats of black ink dye. Unfortunately, even though I let the image dry 48 hours, the spray shellac finish caused the black to run. Bummer. It also left a rough texture as it dried…maybe the outside humidity of 90% caused them both? I dunno…but will spray inside from now on. And repair this finish. Amazing and beautifully intricate work Terry. they look great. Well done. This is certainly a beautiful lot of spoons. Congratulations. Your spoons are incredible Terry. You get an amazing finish on them. I can only imagine how much sanding those bowls take. Some beautiful spoons there sir, great job. Sweet spoons. I like the details. Nice work Terry. I especially liked the comments you gave about each carving, re tool use, finishing and sealing. I found the comments useful for me as I go through the same process in my carvings. The finishing process of a project is a long and tedious one but worth the effort! They look like fun projects! Each one has it’s own character. Nicely done. Sweet spoons, thanks for the post! Thanks for the kind words, ya’ll. Very nice looking Terry. 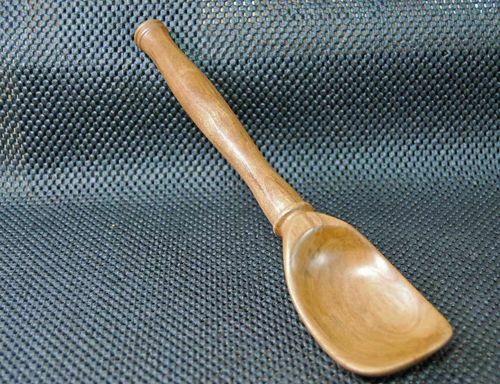 I only know how to do these with hand tools, so what are the usual power tools you use to carve the spoon bowls? They all look great! Sure hope you don’t mind copycats. disc sander, belt sander, both bandsaws, inflatable sanding drums, and tons of hand sanding. Need to post Blog soon with photos!